After reading all the good reviews on FH, I purchased tickets to the Happy Together Again tour. I was not disappointed ... it was outstanding! All the groups were great. I can’t say one negative thing. I didn’t catch the name of the singer who took Rob Grill's place, but he was right on. Now comes the good part. We went backstage after the show and talked to all the performers. I have to admit for a 65 year old man I felt like a groupie! They all were great. Talking to us, posing for pictures, telling us stories about the old days. If you get a chance to see this show, don’t pass it up. It’s more than worth the price of admission. Looking forward to next year already. I attended the very first concert of the Happy Together tour in Westbury, NY, a few weeks back and would like to share my comments as well. Overall, I thought the show was great, surpassed last year’s tour with the inclusion of the Association, and a good value based on the all the groups performing and the ticket cost. 1. The Buckinghams: I’ve seen them many times and they have always put on a great show. I was very disappointed this time. Understanding the tight time format, they chatted more than they performed. They were incessant with their constant references to age, senior citizens, how this was the “senior’s tour”, etc. Enough already. The old-age jokes wear thin after a while. I don’t need to be constantly reminded how old I am. Trying the 60’s jacket on was a further waste of time. They never got to perform many of their songs because they were too busy talking all the time. What were the fans there for? Just shut-up and play already! As much as I’m being critical of the Buckinghams constant references to the age of the audience, I feel all the performers were guilty of it. The show was peppered throughout with those comments from all the performers. I just don’t get it. After 3-4 times, where’s the humor? I’m 57 ... maybe they should be gratified that these “senior citizens” still have the desire and the disposable income to attend these shows and stop mocking the audience. Personally, I think Nick Fortuna should cut off his pony-tail and transition to a more current look hair style than trying to hold on to, or preserve some image from the 60’s that really out of date. Nick looks like he’s the one stuck in the 60’s.
. The Grass Roots: It’s a sham to call them the Grass Roots. Why not just call them the Grass Roots Tribute Band? Without Rob, there are no original members; they have no actual connection to the real Grass Roots other than the fact that Mark Dawson & Dusty Hanvey previously played with Rob Grill. It was well known way before the tour commenced that Rob Grill was not going to participate in this tour due to health constraints, and that was before his fall and further health deterioration. Why include them on the bill? Was that just to infuse some cash for Rob’s on-going medical expenses? Other than those two issues, a great tour to see and musical experience. Kudos to the Turtles, Association, & Mark Lindsay. I apologize for sending this unsolicited idea to you, but I guess I'm bold enough to risk somebody getting ticked off at me. I'm trying to get a real "grassroots" movement going here, but such a thing requires a wider sphere of influence than I have, stuck in a law office 21 hours a day. Plus, I have no "target audience", no way to get the word out and around -- not even a show to attend to try to coordinate things in an on-site, face-to-face, person-to-person appeal. But, you being in Chicago, maybe your work can reach some of all those Buckinghams fans headed to see their favorite band this coming weekend? As we all know, just three weeks ago this year's Happy Together Tour 2011, which is on its way to the Chicago area posthaste, lost one of the all-time great guys on the "oldies" circuit -- Rob Grill, the heart and soul of the GrassRoots. He was actually not with the tour this year, but everybody hoped he'd be able to join in sometime, somewhere. Poor Rob seemed to have nothing but bad luck in the health department for the last decade or so, yet he showed up for duty wherever and whenever he felt he could (even when rest would have been the better way to go), and gave it everything he had. He loved the Grass Roots, he loved the music, and he loved the fans. Unfortunately for all of us, after the really bad fall in June and the resulting traumatic brain injury, the miracle it would take to pull him through this time just didn't happen. We shall not look upon his like again. When the GrassRoots band (hand-selected by Mr. Grill, by the way) plays "Midnight Confessions", each time they get to the final line of the "in my midnight confessions ..." chorus, specifically the line that goes: "I LO-O-OVE YOU", it would be a great way to let the band know the folks in the audience still have Rob Grill right up front in their GrassRoots thoughts if the crowd were to shout out in unison with that line: "WE LO-O-OVE YOU, ROB!!" I don't mean to "shout out" in the usual audience-participation wimpy-wimpy wishy-washy self-conscious mumbly way. I mean: People!! Shout it loud, shout it clear, so Rob up in Rock-n-Roll Heaven can hear!! If you made it this far reading what I have to say, ... wow, THANK YOU for your indulgence. If you'd like to take the idea and run with it, bless you, young man. And now we are done here. And don't forget the 2003 film "My Dinner with Jimi" by Mark Volman and Howard Kaylan, on their crossing paths with Hendrix. But you'd better hurry ... tickets are selling fast! Shepard Fairey has announced a limited-edition art print celebrating the 40th anniversary of George Harrison's Concert for Bangladesh. The work, titled "Friendship and Support," which will be available via www.ObeyGiant.com on August 8, supports the George Harrison Fund for UNICEF's work with children affected by the famine in Africa. 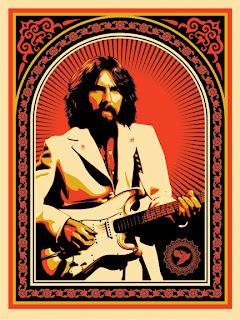 "George Harrison has been an inspiration to me and musicians across the world. I love the Beatles, and George's album All Things Must Pass is one of my all-time favorites. What I also love about George is his political consciousness because I'm a passionate believer in using creativity for social good. Eugene McDaniels, who recorded the 1961 hit "A Hundred Pounds of Clay" and later wrote Roberta Flack’s chart-topping single "Feel Like Makin’ Love", has died at 76. Man, I loved Gene McDaniels! I have his Greatest Hits CD and can't listen to it enough. "Point of No Return" is incredible! You should feature some of his music on your Sunday's Forgotten Hits. Eugene "Gene" McDaniels, the Omaha native who had six top 40 hits in the '60s, died in his sleep after a short illness Friday (July 29) at his home on the coast of Maine. He was 76. Born in Kansas City, he grew up in Omaha and studied at its Conservatory of Music. Moving to Los Angeles, he began to sing in jazz clubs in 1954 before being signed by Liberty Records in 1959. His hits included "A Hundred Pounds Of Clay" (#3 - 1961), which was banned in England because of its religious lyrics, "Tower Of Strength" (#5 - 1961), "Chip Chip" (#10 - 1962) and "Point Of No Return" (#21 - 1962). In later years Gene was a successful composer, penning Roberta Flack's "Feel Like Makin' Love" (#1 - 1974). Gene also worked as a producer and arranger with such artists as Gladys Knight, Merry Clayton, Melba Moore, Vikki Carr and Nancy Wilson. He appeared in the movies "Ring-A-Ding Rhythm" and "The Young Swingers." PORTLAND, Maine (AP) — Gene McDaniels, who recorded the 1961 hit "A Hundred Pounds of Clay" and later wrote Roberta Flack's chart-topping single "Feel Like Makin' Love," has died. He was 76. During his career, he has had hits as a producer, writer and artist. McDaniels' first hit was "A Hundred Pounds of Clay." The song, which featured his take on the Biblical account of the creation of the first woman, peaked at No. 3 on the Billboard pop chart in 1961, the same year his song "Tower of Strength" hit No. 5. McDaniels also recorded other hits, including "Point of No Return" and "Another Tear Falls." As his success as a pop singer faded, McDaniels emerged as a successful songwriter. His most famous song, "Feel Like Makin' Love," went to No. 1 for Flack in 1974 and was also nominated for a Grammy. McDaniels' songs were also recorded by top artists like Aretha Franklin, Gladys Knight & the Pips, Johnny Mathis and Ray Charles. In 1986, McDaniels received an award from BMI for his work on "Feel Like Makin' Love." His website says the song has achieved more than 6 million performances and has been recorded on 400 albums. His song "Compared to What," received new life recently when it was re-recorded and released by John Legend and The Roots on their 2010 album, "Wake Up." Its socially conscious lyrics also led it to be used in eight motion pictures, including "The Ice Storm" and "Casino." Even though McDaniels is best known for music that made the pop charts, his wife, Karen, says her husband's first love was jazz and he continued into the genre long after his pop career ended. He was working on music projects as a singer, writer and producer until his death, releasing an album of his own as recently as 2009. "He is music. He cannot not do music. Every day was about music and his family," Karen McDaniels said. McDaniels also branched out into movies in his later years. According to his website, 15 years ago he got involved in writing and producing film and video. He also did video game and audio book voiceover work. Born in Kansas City, Kan., McDaniels was raised in Omaha, Neb. His father was a minister and he sang in church choirs before leaving home for Los Angeles as a young man to break into the music business. He moved to Maine about 25 years ago, his wife said. McDaniels is survived by his wife, five sons, one daughter and a sister. When I interviewed Roberta Flack for my book "The Top Ten" in a recording studio in 1981, a guy walked in, sat down and listened intently to my questions and her answers. I assumed he was her publicist or manager. After we finished, Roberta turned to him, smiled and said, "Hi, Gene." He replied, "Hi. Do you know where the rest rooms are around here?" After Roberta told him and the man strolled out of sight, Roberta turned to me and said, "That's my friend Gene McDaniels." "Gene McDaniels!" I said with surprise. "Oh," replied Roberta. "You know who he is?" "Well, YEAH," I said. "I had no idea where he was. Do you think he'd be willing to let me interview him?" "I don't know," said Roberta. "He doesn't like to talk about the old days." Although mostly forgotten by radio and the public, Gene McDaniels won a lot of respect among his peers for his songwriting prowess, which showed off his enormous love of jazz ("Feel Like Making Love," "Compared To What," "Reverend Lee," etc.) McDaniels' biggest hits as a pop singer, though, have transcended time and still work: "A Hundred Pounds of Clay," "Chip Chip," "Tower of Strength" and "Point of No Return." Did anyone ever comment on the Cheap Trick concert where the stage blew over in Canada two weeks ago? Hmm. They are coming to our Nebraska State Fair next month. I hope they realize that the wind blows hard here too! What a thrill for you and your family to see the Brian Wilson Concert and in such an intimate place!! So he still has that falsetto voice. Did he sing Caroline No? One of my favorites. The Beach Boys, Beatles and Rolling Stones will always be my favorite groups. How great to be there with your daughter and near the front row!! That is great that Brian did so many songs including all the "lesser known" even tho MOST musical 60's "laymen" know "Salt Lake City" and the others as much as the Beach Boys' hits. Certainly, "Sail on Sailor" was a fave of Larry Lujack, as he was STILL playing it in 1986, just as the sun was setting on the big 89! Here's a real oldie jingle that Brian did in 1964 for the Big 89! He might have had a few problems popping the P's, but fun to hear him "searching the radio dial for a station that swings on this special version of "Dance Dance Dance"! Dex Card called his WLS show "Swingding" back then!! We can go see Al Jardine & Endless Summer Band. We can go see Mike Love & Beach Boys. We can go see Brian Wilson. Brian Wilson's house currently listed for $1.5 million. I guess it pays to write & sing about Surfing, Cars & California Girls. Clark Besch mentioned that one Saturday morning on my Kountdown show on KOMA I played a song called THE LOSER but not the Gary Lewis song. The song was by Peter Courtney on Viva Records (#609). The song was written by Mason Houghland - Betty Russell. The flip was the song PICTURES ARE MY ONLY SOUVENIRS written by Al Capps - Thomas L. Garrett - Glen D. Hardin. I believe you’re thinking of “The Loser” by Peter Courtney, issued on Viva in 1967. It bubbled under nationally at #121. I was a bit disappointed that my memory did not relate to what I hear today. It's ok, but not as good as I thought. Still, hearing a song on Larry's countdown that I did not know was always a treat!! New York, August 2, 2011 - ABKCO Records and HDtracks are pleased to announce the addition of The Animals Retrospective and Herman’s Hermits Retrospective to their catalog of super high definition digital downloads. These two new ABKCO releases are offered in 88.2K / 24bit, 176.4K / 24bit and are DRM-free. They follow in the footsteps of the highly successful ABKCO Records / HDtracks campaigns for the Rolling Stones and Sam Cooke catalogs. The Animals Retrospective features twenty-two tracks, spanning the years 1964 - 1970 and documents the group’s changing sound, from the early R&B productions by Mickie Most through the psychedelic tinged productions of Tom Wilson. The Animals Retrospective covers the evolution of the group, both in name (from The Animals to Eric Burdon & The Animals) and personnel. The album features many hits that were well received on both the U.S. and U.K. charts: “House of the Rising Sun” (U.S. & U.K. #1), “I’m Crying” (U.S. #19, U.K. #8), Don’t Let Me Be Misunderstood” (U.S. #15, U.K. #3), “Bring It On Home To Me” (U.S. #32, U.K. #7), “We Gotta Get Out Of This Place” (U.S. #13), “It’s My Life” (U.S. #23, U.K. #7), “Don’t Bring Me Down” (U.S. #12, U.K. #6), “See See Rider” (U.S. #10), “Help Me Girl” (U.S. #29, U.K. #14), “When I Was Young” (U.S. #15), “San Franciscan Nights” (U.S. #9, U.K. #14), “Monterey” (U.S. #15) and “Sky Pilot” (U.S. #14, U.K. #40). The Animals were noted for their interpretations of classic R&B, blues, soul and folk tunes. Among the band’s best known hits included on Retrospective are “House of the Rising Sun,” “Baby Let Me Take You Home,” “Boom Boom,” “Bring It On Home To Me” and “See See Rider.” The legendary Brill Building songwriting team of Barry Mann and Cynthia Weil wrote "We Gotta Get Out of This Place," especially for the band; the song became the defacto anthem of US troops serving in Vietnam. The U.S. single version of the song is included in the release; it has been sought after by fans in digital format as it differs from its UK counterpart. Also notable is the fact that “House of the Rising Sun" is the unedited album version. Following his departure from the Animals in 1970, Eric Burdon joined forces with the U.S. based multi-cultural band War. Eric Burdon & War's smash hit "Spill the Wine" (U.S. #3) is also included on this Retrospective. The Herman’s Hermits Retrospective features twenty-six tracks spanning the years 1964 - 1969 and the group’s work with producer Mickie Most. The album features sixteen U.S. and U.K. top ten hits: “I’m Into Something Good” (U.K. #1), “Can’t You Hear My Heartbeat” (U.S. #2), “Silhouettes” (U.S. #5, U.K. #3), “Mrs. Brown You’ve Got A Lovely Daughter” (U.S. #1), “Wonderful World (U.S. #4, U.K. #7), “I’m Henry The Eighth, I Am” (U.S. #1), “Just A Little Bit Better” (U.S. #7), “A Must To Avoid” (U.S. #8, U.K. #6), “Listen People” (U.S. #3), "Leaning On A Lamp Post" (U.S. #9), "Dandy" (U.S. #5), "No Milk Today" (U.K. #7), "There's A Kind Of Hush" (U.S. #4, U.K. #7), "Sunshine Girl" (U.K. #8), "Something's Happening" (U.K. #6), and "My Sentimental Friend" (U.K. #2). Retrospective includes songs written by 10cc’s Graham Gouldman, the Kinks' Ray Davies, Donovan and the great songwriting teams of P.F. Sloan & Steve Barri, John Carter & Ken Lewis, Gerry Goffin & Carole King, and John Carter & Geoff Stephens. It’s notable that tracks from the album feature studio work from Jimmy Page and John Paul Jones long before the founding of Led Zeppelin. ABOUT The Animals: The band’s origins can be traced back to Newcastle upon Tyne in 1962 and 1963 when Eric Burdon joined the Alan Price Rhythm and Blues Combo. The original line-up was comprised of Eric Burdon (vocals), Alan Price (keyboards), Hilton Valentine (guitar), John Steel (drums), and Bryan "Chas" Chandler (bass). They were dubbed "animals" because of their wild stage act and the name stuck. The Animals' moderate success in their hometown and a connection with Yardbirds manager Giorgio Gomelsky motivated them to move to London in 1964, just in time to be part of the British Invasion. Their major label debut was a rocking version of the folk classic "Baby Let Me Follow You Down,” retitled "Baby Let Me Take You Home" which was their first single. It was followed in June 1964 by the transatlantic #1 hit, "House of the Rising Sun". The Animals' initial chart run was masterminded by legendary producer Mickie Most who paired them with such innovative repertoire choices as Sam Cooke's "Bring It On Home To Me" and Nina Simone’s "Don't Let Me Be Misunderstood.” Burdon's powerful, deep voice and the band's use of keyboards as much as, or more than, guitars were unique elements that made The Animals' sound stand out from the rest of the British Invasion pack. ABOUT Herman’s Hermits: Herman’s Hermits (Peter Noone, Keith Hopwood, Karl Green, Derek Leckenby and Barry Whitwam) were at the forefront of the “British Invasion” and were the top selling pop act in the U.S. in 1965, even beating out the Beatles. The Hermits were unique in melding a traditional British music hall influence with good time rock ‘n roll. The Hermits were among the younger musicians on the Manchester band scene in 1963 when they started playing together as the Heartbeats. The city was home to dozens of promising bands, most notable among them the Hollies, the Mockingbirds, and Wayne Fontana & the Mindbenders. Later that year, the Heartbeats got a new member in 16-year-old Peter Noone (born November 5, 1947), who filled in one night when their regular vocalist failed to turn up for a gig. Noone was already a veteran actor who had trained at the Manchester School of Music and Drama. He had been a child star on television in the late '50s on the popular British television series Coronation Street, but he always had musical aspirations. As a vocalist with the Heartbeats, he initially worked under the name Peter Novak. Accounts vary as to the origins of the name the band ultimately adopted — some say that their managers remarked on the facial resemblance between Noone and the character of Sherman in the Jay Ward cartoon show "Mr. Peabody & Sherman"; others credit Karl Green with mentioning it. In any case, "Sherman" became "Herman" and the group, in search of a more distinct name, became Herman & His Hermits and then Herman's Hermits. Just wanted to let you know that my book -- "Eight Days A Week: Births, Deaths & Events Each Day in Oldies History", is now available in an expanded and updated Kindle edition. That means you can take it with you on your Kindle, PC, Mac or smart phone. Look for Nook and iPad versions to follow soon. If you're interested in oldies remakes, hooyoosay have just released the album "In dekay", containing 22 tracks of mid-sixties guitar-pop, rock and rhythm and blues cover songs. For samples, you can audition and view the track listing at songrila, amazon or iTunes. I actually liked the sax solo on the alternative version of Ruby Baby. I'm curious as to the beats per minute of Rip This Joint by the Rolling Stones. Even Big Daddy gets the blues. Like when he misses the live Thursday broadcast of the Atomic Cocktail program. But he needn’t. All he has to do is visit the LuxuriaMusic homepage, select “Podcast,” then download all the Atomic Cocktail shows he wants. Leapin’ Lizard Kings! Listen to your favorite Oldies plus other tunes that you won’t hear anywhere else! Playing the music of the 50’s and 60’s with a touch of the 40’s. Pull up a chair and join our chat room with people around the world as they all listen to … THE GREATEST SONGS THAT EVER LIVED! Relive old memories with the classics and hear conversations with phone in guests. Feel free to email me at djstu43@verizon.net for requests and dedications. It's Stu's Sunday Night Doo Wop Party!!!!! This is besides my regular program on Friday nights. Hope you can join me ... 'cause I don't want to be alone! By the way, our long-time FH Buddy Ronnie Allen now has a program airing on Oldies Your Way, too! You can catch him on Friday nights right before Stu Weiss' show. "Ronnie Remembers", featuring Ronnie Allen and his interviews, will be on from 6 PM till 7 PM (EST) preceding Stu's show each week. This Friday night Ronnie will air his past interviews with Ronnie Dove and also Kathy Young. I am delighted to announce my new affiliation with Internet station Oldies Your Way . The address of their Home Page is http://www.oldiesyourway.com . Clicking on any of the links within this message will take you to their Home Page, where you can instantaneously with simple mouse-clicks listen to the station and / or visit their chat room which is open during all of their broadcasts. Starting tonight, Friday, August 5th, I will be hosting a "Ronnie Remembers" show every Friday evening from 6 to 7 PM Eastern Time, immediately preceding Stu Weiss's world-famous "Pop Shoppe" show, which will be heard from 7 PM till 3:01 AM Saturday morning. Each week I will present one or two interviews. They may be older ones that are also available on my Radio Page or they may be ones that are not available publicly anywhere. I may eventually do world-premieres of interviews that will subsequently be posted on my Radio Page and I may also do live interviews. On tonight's debut show I will be presenting my fascinating interviews from a few years back with Ronnie Dove and Kathy Young. During the airing of the show I will be in the chat room. It is very easy to enter. So while my interviews are playing, you can enter chat and make comments about Ronnie or Kathy or ask me questions or simply converse with other listeners. It's "Oldies Your Way" and also "Chat Your Way"! I am so pleased about all of this and I would love to see many of you join me for our debut show and every Friday thereafter. Thanks so much for reading this and hopefully joining me tomorrow and/or in the future! Thanks for bringing our attention to the Lady Ga Ga appearance on the Howard Stern show. I totally loved it. When Lady Ga Ga first came on the scene she reminded me of a cross between Cher and Madonna. I have always loved Cher and Madonna who, for the times, were very cutting edge. But Lady Ga Ga can out sing either or both of them. She doesn't need all the outlandish stuff. I know she probably does that stuff to attract that younger crowd. I saw her interview with Barbara Walters last year and I was very impressed with her. She is very well spoken and interesting. Thanks again. Don't know if you caught Lady Gaga on Jimmy Kimmel. She has a good sense of humor. Jimmy Kimmel = If you ever get married & have kids - and they turn out not to be gay - will you still love them? Have you picked up the book "Canyon of Dreams, The Magic and Music of Laurel Canyon" by Harvey Kubernik? It's a beautiful hard cover book with a buttload of pics. In it you'll find about ten pages written by Randy Meisner about how the Eagles got together after the Poor and Poco ... (Randy's ex-wife Jennifer is writing a book about the Eagles right now!) ... plus stories about the Byrds, CSN&Y, Linda Ronstadt, the Mamas and Papas and the list goes on. I got this from Amazon and it was less than $10.00. This is a MUST READ! Have you seen it? If you haven't picked this up yet, you need to! Give my best to Harv ... he did a GREAT job with this book and I'm pushing it for him! Harvey Kubernik and I were both rock journalists and interviewers in L.A. at the same time (in my case, from 1973 to 1982). We crossed paths a few times and, as noted in my previous email, he sat in on a few of my classes while I was teaching rock and pop history at UCLA. At one of those he brought along a few friends, one of whom had a camera, and a few shots were taken of Harvey and I along with some of his pals in front of the blackboard. It's kind of unfortunate that no audio or video recordings were ever made of any of my lectures (as far as I know) and the only photographs ever taken were the ones taken at that particular time. I still have all my class notes, though, plus some students' essays, the audio tracks I played (off a reel to reel tape deck) plus the slides I showed those assembled. It would be great to get a print of one of those photos if Harvey still happens to have them. A quick Google search includes a little bio of Harvey on the Huffington Post website. According to that article, he's written a couple of books, a number of articles for various periodicals, a few liner notes and worked as an A&R man for MCA Records around 1979. I am a little surprised ... but then again maybe not ... that me in England has to inform the readers of Forgotten Hits, an American publication, about one of America’s finest artists getting a place on the Hollywood Walk of Fame.